Although Holmes calls his process deductive thinking, it’s actually the opposite: inductive thinking. And guess what? Many of your gifted students are blessed with this same skill. Inductive Thinking: identifying patterns within small details to form big ideas. 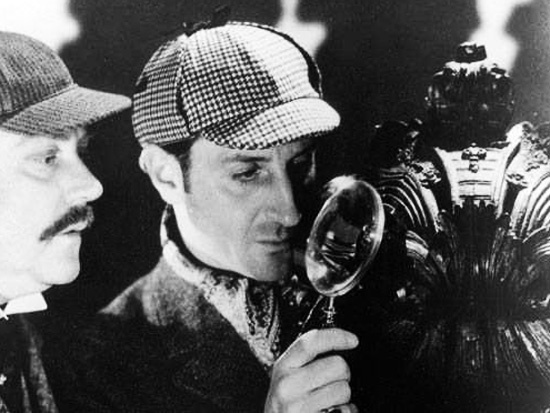 Holmes uses his ability to formulate patterns from details to solve crimes, but your students might use the same ability to derail a dull lesson! This means that gifted students, in contrast to the rest of us, really do just get it and don’t need as much repetition or explanation. Gifted students spot patterns quicker than the rest of us. They learn faster. They naturally move from concrete to abstract, just as Holmes inferred Watson’s hometown from his shoes. Students practice examples in groups. Notice that this is built on the very idea gifted students disliked most: lots of slow practice with small pieces of information. Let’s use inductive lessons to work with gifted students’ natural tendency to abstract. Provide students with unorganized details. Ask students to look for patterns and form categories. Use the patterns to develop a big idea. We used a variant of this type of lesson when helping students develop strong scientific opinions. Notice that students immediately manipulate details into abstract categories and then into an even more abstract generalization. This experience is also open-ended, since students may arrive at different (but still correct) big ideas in the end. When teaching about the Nile River, we might organize our lesson around the advantages and disadvantages of the river. Using an inductive method, we’re going to put the development of such a generalization into our students’ hands (scary right!?). We begin this inductive lesson by researching details about The Nile. Students have to be armed with facts before they can build big ideas. If this is a subject they’re already familiar with, hold a brainstorming session. Using those group names, students develop a generalization encompassing their understanding of the Nile. The Nile was a paradox, having both advantages and disadvantages“. The benefits of travel and food outweighed The Nile’s many dangers. Warning Kids will want to just list the categories: “The Nile was useful for travel and food, but also had danger.” Challenge them to move beyond this, offering some judgement or analysis in their statement. This may be the most challenging part of the lesson for them. We could extend this lesson by introducing new facts about the Nile to test students’ generalizations. Does the big idea truly hold up? Inductive thinking is natural for gifted students. Building lessons around this trait makes teaching easier for you and more enjoyable for them. Next time, we’ll continue our look at inductive learning by examining inductive lessons in math.